Mushroom Biryani is a great recipe to stray away from the usual vegetable biryani or egg biryani we all know and love. 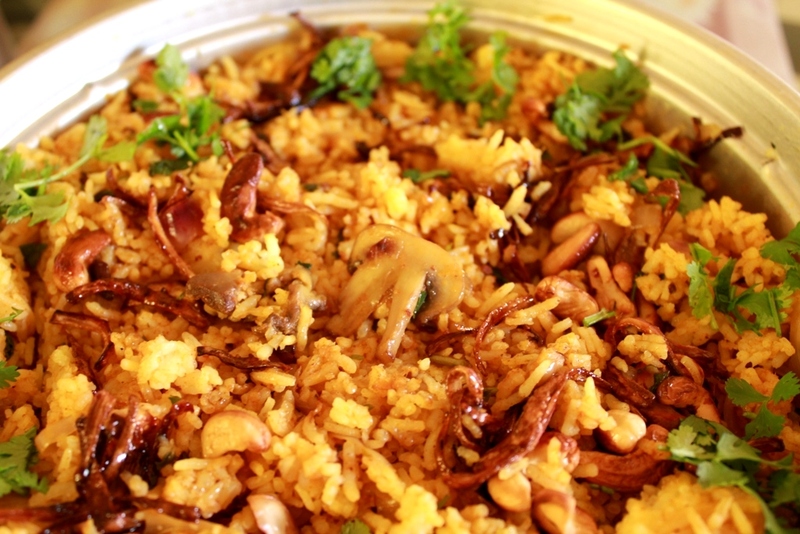 Learn how to make this delicious and easy mushroom biryani using very simple ingredients. With all that talk of non vegetarian biryani yesterday, I simply had to share the Mushroom Biryani Recipe I tried a couple of weekends back. I usually follow a pretty standard recipe when I make biryani but I opted to make this one a bit more spicy and sour (with tomatoes) than usual. We loved it and I am making some more for a potluck tomorrow. Mushroom Biryani can be made in advance and kept in the refrigerator for up to two days. I find that this elevates the flavours as they mingle together and when you reheat and serve it, it tastes fantastic. Mushroom Biryani is also a great recipe for lunch boxes and packing on a trip since it’s a great one pot meal that few people would dislike. Just pack along a raita to accompany the mushroom biryani and you are all set. You may also like – mushroom fried rice, mushroom pulao, mushroom korma, and mushroom tikki recipe. 1. Heat oil and ghee and throw in the onions. When they are golden brown, add the ground masala paste. Don’t worry if some of the spices are not ground fine. Mix well until nicely fried, for about 2-3 mins. Then add the chopped mushrooms. 2. The mushrooms will give out some water, so cook until the mushrooms are soft and the water has all evaporated. Then add the chilli powder, turmeric, garam / biryani masala and fry for a minute. After this, add the pureed tomato and tomato paste / ketchup. Stir well and cook well until all the ingredients come together. No need to add water at any stage. Add salt. 3. Gently mix in the cooked basmati rice and garnish with the fried onions, cashewnuts and coriander leaves. Serve Mushroom Biryani hot with raita. Loved the biriyani Nags… Had extra helpings as usual… Cheers. I have wanted to try something on your website for ages – tonight I finally did and made thi biryani. It was delicious! Thank you! I rely totally on the internet for cooking on a daily basis… I came across your site 5 days ago.. I must say what attracted me to ur site was the photography… then i learnt u clicked it urself! MINDBLOWING GAL! Lavina, thank you so much for the very very sweet words. Encouragement like this always keeps me going 🙂 Keep visiting and have a wonderful new year. Hey Nagalakshmi, Tried this today. David just loved it. Thanks. What better testimonial can I get? Thanks for letting me know 🙂 Hope you are doing good. just cooked this dish for dinner! it was so delicious we couldn't stop eating it. we'll definitely save it for the future and will be often on our menu. instead of 5 chillies i used 1 chilli and 2 serrano peppers and even though i l.o.v.e. spicy food this turned out very hot! thanks for the recipe, will pass it onto my friends!!! hi … i tried this biryani it was yummmy… me and my hubby liked it sooo much … thank u for ur recipe..
hi am shweta… i tried this biryani it was yummmy… me and my hubby liked it sooo much … thank u for ur recipe.. I tried this recipe today… and it turned out to be awesome. thanks for this. Will soon try your other recipes too. That looks so so good! I LOVE mushrooms. I recently made this portobello mushroom tower and it was so yummy! nice & tempting… ur site is intresting. keep the good work on!! Mmmmm…this post has been haunting me ever since I saw its tiny link on facebook. I keep returning to it. Nice box of mushrooms sitting in fridge, this may make it to the dinner table tomorrow! Those fried onions and cashews make it super delicious. I see ! !, Your writting could change the world that you want. Express your thoughts!!. Politics , Business , Entertainment , Sports & Games , Life & Events ,and Health what else?. Meet your like minded here. The top social gathering in one place all the top notches meet here. It is not about win the race, participation is all matters. We proud inviting you to the the internet's best Social community. http://www.jeejix.com . I usually have this feel of rice not mixing well if mixed seperately with curry…but ur version proves me wrong…looks well blended with the masalas…hmm..spicy and tasty!! Will make this for kaya and achu and let you know!! :)yummy yummy biriyani!!! So tempting and it looks awesome dear..
i am so tempted..looks so yummy. Color has come out beautifully, lovely presentation. OMG..traveling to my sisters' place next week – will surely make this there – we both love mushrooms and this will be perfect! Super Super! Wonderful nad mouth watering biryani. First time visit to your site. The biryani looks yum & a nice click too! Tempting Biryani..sure it might have tasted great. Wow… What a Briyani… Want to eat it now itself…. Mushroom briyani luks very tempting,perfect! Wowwwwwww.. very tempting recipe.. looks perfect and delicious.. beautiful clicks !! I've never tried adding tomatoes. Am sure it tastes good with it. Nice photo.